Animal Friends: Animal Friends' Home-To-Home Adoption Program Presents... Indi! Animal Friends' Home-To-Home Adoption Program Presents... Indi! Indi is a terrier/chihuahua mix and will be 4 years old in October. 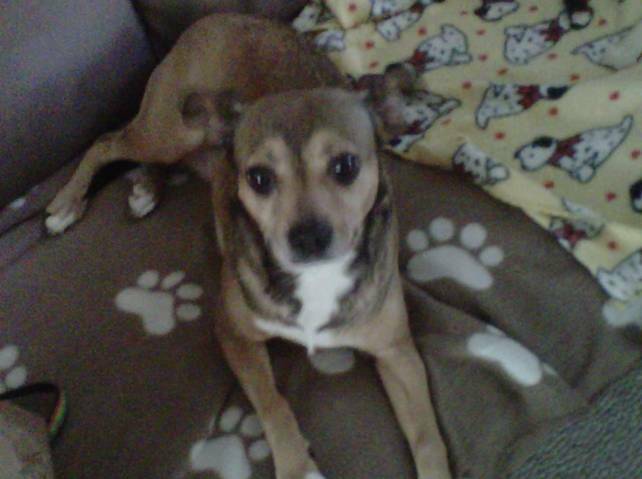 She is 25 lbs., light brown with white markings and the most adorable floppy ears. She is a loving, wonderful girl that will be a lap dog if you let her and doesn't bark unless she gets really excited and her whole body lifts off the ground! She is very friendly, loves peanut butter in her Kong, enjoys a good massage every once in a while and loves belly rubs. She gives lots of kisses and sits when told to. She is crate trained, house trained and is chipped for identification. When you meet her, you will see what a great personality she has and want to give her her forever home. If you can help, write to Judith Krause at judiek18@yahoo.com.